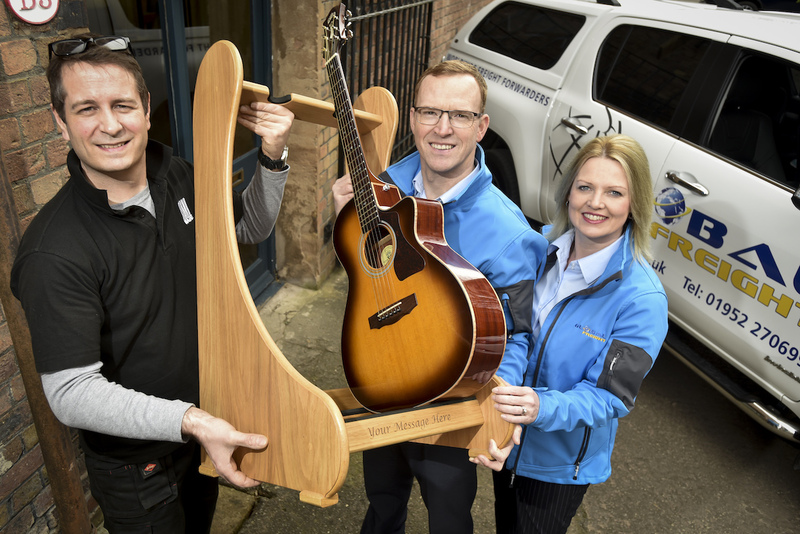 A craftsman who makes handmade and bespoke oak guitar stands and racks is hitting the right notes in a global market after launching into overseas trade with the support of a Shropshire shipping specialist. Andy Bennett, who runs StandMade from a family workshop at Maws Craft Centre near Ironbridge, has secured orders from as far afield as Japan and Canada since teaming up with exporter Global Freight. He is now aiming to double turnover with a key focus on international customers. The keen guitarist launched StandMade just four years ago after ditching a career in live music event management. He spotted a gap in the market for guitar and case stands and racks that he manufactures using traditional carpentry methods. They can also be personalised and tailored to a musician’s individual needs. Andy already counts Manic Street Preachers lead singer and guitarist James Dean Bradfield, Squeeze frontman Chris Difford and folk legend Martin Carthy among his satisfied customers. Being able to trade successfully overseas had been a crucial step in growing his business, he said. “When I had my first overseas enquiry, I genuinely didn’t have a clue how to go about exporting my products. I probably would have done research on the internet and ended up costing myself far more time and money,” he explained. “The stands and racks are pieces of furniture and can be sent to customers fully assembled so I needed a freight company that understood the service I was aiming to provide to my customers as I have worked hard to build up a reputation for quality from order to delivery. Nicole Gunter, Managing Director of Global Freight, said StandMade was typical of the small businesses it aimed to help get a first step on the export ladder. “Exporting for small companies is not about multi-million pound deals – it can be just one order that opens doors to overseas trade, like it did for Andy. International trade is a massive opportunity for smaller businesses but many people are too frightened to take the first step. “Our role is to advise and guide as well as deal with the smooth transport of goods and the vast majority of goods we moved last year across the globe was for smaller manufacturers.